If you want to spice up your photos, you can literally mix them together and create some really cool effects with FotoMix. For users with little to no experience in editing photographs with programs like Adobe Photoshop, FotoMix gives novices users a really great palette of tools to create effects which look like they may have been created with some higher end software. FotoMix isn't strictly a programs mix digital photographs, either. It can quickly perform some editing functions like cropping, rotating or adding text to existing photos. Version 9.2.7 is a freeware program which does not have restrictions and it's free so it doesn't cost anything. 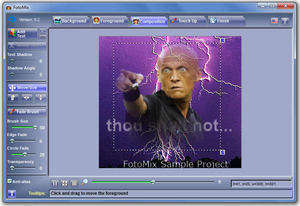 For security reasons, you should also check out the FotoMix download at LO4D.com which includes virus and malware tests. Additional screenshots of this application download may be available, too. FotoMix has a presence on social networks.